The totem artworks of the first peoples of Southeast Alaska, coastal British Columbia, and western Washington are among the most powerful art forms in the world. These beautiful creations can be found in the historic communities of the first peoples of these regions, including modern-day Ketchikan, Alaska. The Tlingit and Haida Tribes call this area home, and their cultural, economic, social, and totem art traditions are alive and well, amazing visitors from around the world. I visited Ketchikan several times during my six-year stay in Alaska from 2004 through 2010, when I worked for the Consulate of Canada, Anchorage. I had forgotten I had these images until I accidentally found them in an old digital archive. I wanted to bring them out of the shadows and into the light. These images date from 2007, so the totems since that time have been weathered by the relentless rain and moisture of that beautiful, soggy corner of North America. If you visit, Ketchikan, by ferry or on the Alaska Marine Highway, you can find the totems at the Clans Totem Circle, at the Totem Heritage Center for historic poles safeguarded in climate-controlled protection, and at the Southeast Alaska Discovery Center. To understand the meaning of this intricate artwork, the myths, and the natural world that inspired these magnificent creations, you should first understand the stories of those who created them. Try exploring the stories about Alaska’s Tlingit and Haida peoples. The official site of the Central Council of the Tlingit & Haida Indian Tribes of Alaska provides a great resource on the priorities and heritage of the first people’s of Southeast Alaska. I hope you get a chance to visit Ketchikan and the other communities where these cultural traditions continue to thrive. The mural of Opal Whitely in Cottage Grove was being touched up during my brief visit in early August 2017. In 1994 and 1995, I worked as a reporter in the small Willamette Valley community of Cottage Grove (pop. 10,000 as of 2017). The city is 20 miles south of Eugene, along the Interstate 5 corridor. When I was working there, the old economy based on timber production and milling was shutting down, and one in five residents was living near the poverty level. In terms of that grim statistic, not much has changed. Today, more than one in five live in poverty, according to the last Census count. I reported on just about everything in Cottage Grove as a local reporter: crimes, sports, civic life, local government, police, fires, successes, tragedies, inspiring people, pets, redevelopment, land use battles, racism, anti-racism, and more. I loved how I was exposed to all of humanity by simply writing stories about people’s lives. I paid a visit to Cottage Grove on my way through in early August 2017. I stopped at my old employer, the Cottage Grove Sentinel, and walked through the historic downtown. It is still a beautiful place, with old brick buildings and merchants working to keep civic life and that social place alive. Some big murals caught my eye. One of the iconic Coca-Cola brand liights up an otherwise dull brick wall. The other celebrates the many covered bridges near Cottage Grove and the celebrated writer and local resident Opal Whitely, painted in 2001 by artists Connie Huston and Howard Tharpe. There are just some of the city’s mural art. Whitely eventually moved to Europe, where she spoke of abuse growing up and not being related to her family. Eventually her mental illness worsened and she was “committed” to England’s psychiatric system, where she was poorly treated. Says Williamson, “The gifted child genius from Oregon’s wilderness spent nearly fifty years buried in a tiny cell on a crowded asylum ward. In the 1950’s she was given a lobotomy.” She died in the place that imprisoned her for decades. Today, however, Whitely lives on as one of the main tourist attractions for the community. If you are travelling down I-5, pull off. Travel to the city center. Take a walk. Shop. Eat at a local restaurant and see all of the murals. You can then pause and reflect upon one of Oregon’s most famous daughters who died in a virtual prison, whose only crime was being hyper-creative and afflicted with a mental illness. Even old factories paid attention to art; look to the corner of the factory roof. I love exploring St. Louis and its neighborhoods. Many are hurting, and my blog posts about the city’s struggles never hide that fact. What I like the most about my journeys of discovery in St. Louis is taking side streets. Without fail, I find new art work (check out the gargoyle on the factory corner), businesses, factories, and sadly buildings and homes in decay and various stages of abandonment. The old Columbia Iron Works facility, which I photographed, is a symbol of the changing economy from manufacturing to information and health care, which do not produce any goods or good blue-collar jobs. A health care foundation was reportedly moving into the abandoned factory site. Outside of distressed areas, one can find breathtaking works of architecture and homes that would fetch a fortune in “hot” real-estate market cities like Washington, DC, or San Francisco. On an upbeat note, St. Louis remains a beautiful, historic place. Here are some of the homes, local businesses, artwork, and surprises I found driving through Forest Park East, Botanical Heights, Shaw, Tower Grove East, and Dutchtown neighborhoods. St. Louis is a city worth discovering, even if you have lived there for decades. Two drinking, smoking foxes sit atop the entrance posts to the Kingsland Court community in the Dutchtown Neighborhood of St. Louis. St. Louis has many great works of public art on display, throughout Forest Park, Tower Grove Park, and other locations in the city. They put to shame the public art of many other cities that are now more prosperous and populated. During my recent visit, I accidentally stumbled on the statues of great white men, as I call them, in Tower Grove Park in the south central area of the city. Businessman and philanthropist Henry Shaw of St. Louis believed that public art played an important role in the welfare of a city, and left a legacy, including the statues. The statues I photographed depict William Shakespeare, Alexander von Humboldt, and Christopher Colombus—a man whose controversial legacy is questioned today. The statues, regardless of their merits, evoke a period of wealth and pride, when the city chose to promote art when it was at the apex of its economic and political power. Much of that art celebrates European civilization and few other traditions and races. St. Louis has always been a city that did not recognize the contributions of non-European groups until the late 19th century. I also discovered a wonderful bronze sculpture in the Dutchtown neighborhood, in South St. Louis, just off Grand Boulevard. Atop a neighborhood gate entrance sat two jolly foxes, swigging from pints and likely smoking pipes. These are located next to the popular Ted Drewes frozen custard stand, where I gulped down a delicious dessert. Now this was a real discovery. There are no jolly foxes where I live in Portland. I think we need some. We take ourselves far too preciously, and we forget other cities have understood the power of public art better than the new cool capitals of the United States. “Keith,” by artist Chuck Close, is a larger than life acrylic painting dating from 1970, in the St. Louis Art Museum collection. This hyper-realist acrylic painting by celebrated artist Chuck Close is one of the best contemporary pieces in the great St. Louis Art Museum. I have been coming back year after year to the museum, and I still find new things to see in his representation of a photo of his friend, Keith. I love how he shows the pores of Keith’s face. Surfing is as much an art form as it is a way of life and beautiful sport. I truly believe that new ideas and inspiration happen for a reason. The trick is to recognize when your thinking and interests turn a new direction. Great creative minds have often worked that way. Robert Greene’s book Mastery beautifully documents this. It’s a study of the creative process and the mastery of skills. He shows how these changes emerge and how accomplished persons, past and present, responded to those vicissitudes. I recently had breakfast with an old friend of mine, whose father is one of the premiere avant-garde artists from Taiwan known as the Blue Moon Group. My friend said his father was constantly changing and exploring new ideas. I think this is true of successful people in any field–and unsuccessful people who aren’t recognized by their peers. I am feeling a lot of changes lately, relating to the ocean, my response to circumstances in life, and my lifelong passion for combining physical activity with seeking contemplative spaces to find that quintessential balance in life. Surfing lately has been a space that makes sense right now. I am not questioning it. I am listening to the muse. I am seeking out its siren call. So far I have been richly rewarded, including new friendships and perspectives. This shot was taken two years ago in Leucadia, in San Diego County. It was an epic trip that combined major breakthroughs with my first serious foray into surfing as a way of life. I do not think that was an accident. Hoping you all catch your wave and take it for a ride. In 2004, I visited Egypt. This was a dream come true. There is so much history in that land, one cannot appreciate its diversity in just one visit. My trips usually focus on projects and themes. On this trip, I wanted to explore Coptic and Christian monasteries, having recently seen and visited monasteries in the Occupied West Bank and Turkey a few years earlier. I also was influenced by William Dalrymple’s superb travel and history narrative of the monasteries and Christians of the Mideast called From the Holy Mountain. On this trip I visited the historic Coptic Egyptian monasteries of: Bishoi and Suriani near Cairo, St. Anthony and St. Paul near the Red Sea (only made it to the entrance of St. Paul), the long-abandoned St. Simeon near Aswan, and St. Tawdros Monastery near Luxor. I also visited and stayed at St. Catherine’s Monastery, the Greek Orthodox monastery founded during the reign of the Byzantine Empire and sacred to Jews, Moslems, and Christians. Some are 1,600 years old, and all but one of those seen here is still functional today. 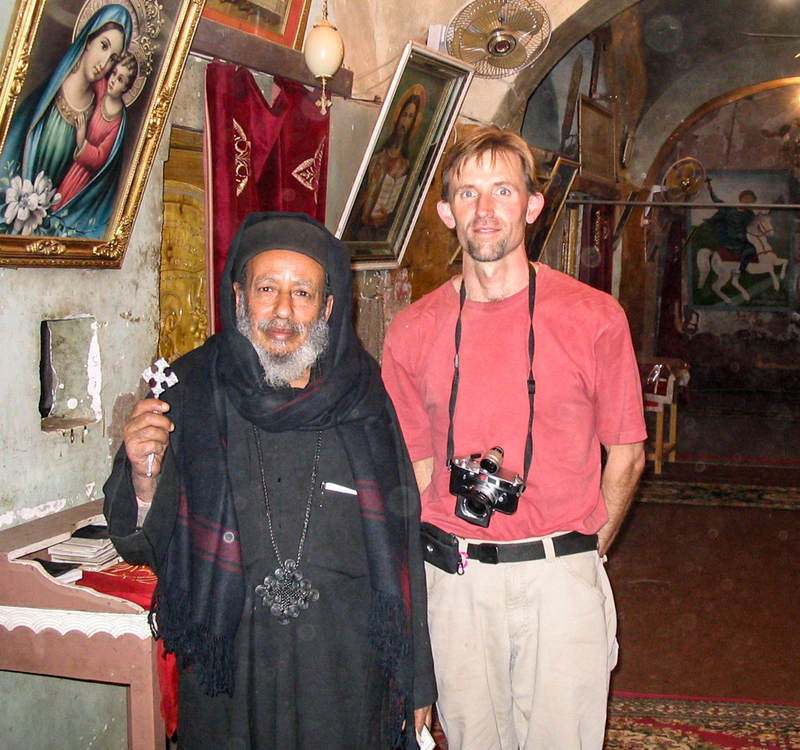 My host at St. Tawdros Monastery gave me a tour of the historic site, just outside of Luxor. My visit required the permission of the chief for the local security detail, who also joined me. This was one of several times Egypt’s security forces went out of their way to both help me and perhaps ensure I did not do anything suspcious. This visit was one of my highlights. Still, everything about my 2004 trip was memorable—from meeting with Coptic monks to seeing pilgrims from Africa, South Korea, and other locations file through St. Catherine’s Monastery in the Sinai, where Moses reportedly found the burning bush. While getting to each of these places proved dangerous, difficult, and expensive, I was rewarded by having a deeper appreciation of Christianity’s monastic traditions that represent some of the best elements of the faith that remain very much alive today. 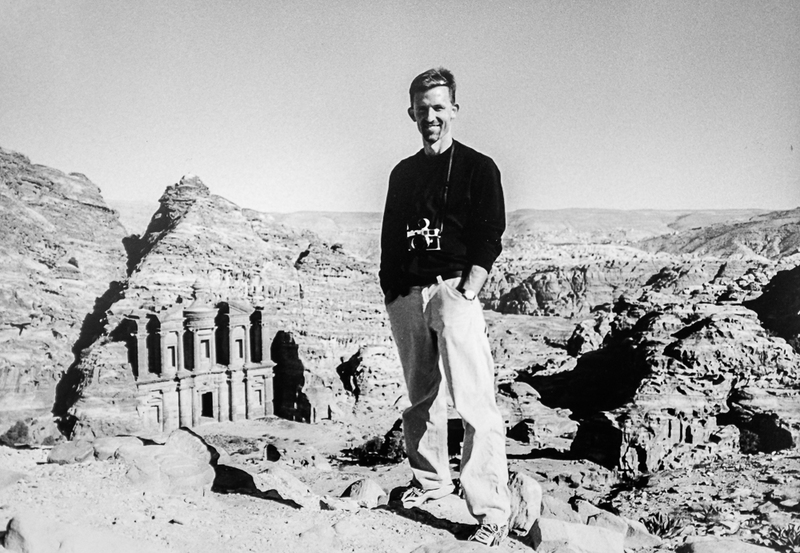 You can read a history of Egypt’s ancient monasteries and Christian monasticism in Egypt in Michael McClellan’s book: Monasticism in Egypt: Images and Words of the Desert Fathers. There are also some wonderful historic photographs of monastic life from the first decades of the 20th century on this blog published by Diana Buja. You can also buy Gawdat Gabra’s Coptic Monasteries: Egypt’s Monastic Art and Architecture. Scene above: The world-famous King St. Louis IX statue on Art Hill in Forest Park, Sts. Peter and Paul Church, St. Anthony of Padua Church. Click on each picture to see a larger photo on a separate picture page. St. Louis’ namesake comes from French King Louis IX, one of France’s few pious rulers who ruled in the 13th century and died in 1270. The city’s European origins can be traced to French traders on the Mississippi River. One, Pierre LaClede, gave the trading post its name after the revered ruler 252 years ago. That name stuck, and the city of St. Louis was born (on ground inhabited for thousands of years by Native Americans). The city’s name also helped to attract many Catholic European immigrants, from Italians to Germans to Irish. Many of the city’s strongest and most powerful education and social institutions, from hospitals to orphanages to private schools to St. Louis University, were also founded by Catholics. The Archdiocese of St. Louis virtually runs the city’s homelessness programs and non-profit social service sector. For a visitor to St. Louis, one of first things one sees are brilliant and beautiful church spires rising tall above old neighborhoods. These institutions still play a vital role in many depressed areas of the fading, formerly great industrial city. Every time I visit my family in neighboring University City, I always take a tour and rediscover this amazing legacy. I still am dazzled by the skill and confidence with which St. Louis’ earlier residents built their community purposefully, to live up to the city’s name. The statue is the prominent piece of art in Chapman Square, in downtown Portland. Before the meteoric rise to fame–and then collapse–of a small group of well-armed militants professing to be on a mission from “god,” there were others who came to Oregon more than 170 years ago on a not-so-different quest. Oddly, they too were looking for land to farm and ranch as well, and they carried guns and brought their bibles. We call them the Oregon pioneers, and they are celebrated with the Promised Land statue in Chapman Square, in downtown Portland. The one chapter missing from this statue is what happened to the Native Americans who were living here when these settlers arrived. At the time the American pioneers began pouring into the region by wagon train, Native tribes were experiencing large-scale public health disasters, from malaria, smallpox, measles, and tuberculosis and other diseases that destroyed entire villages and decimated the original inhabitants of the region. Nine out of 10 lower Columbian River inhabitants lost their lives to disease between 1830 and 1834 alone. When many settlers arrived, they truly found land emptied because of these radical changes brought about by these diseases. The more recent group who wanted to “reclaim” federal land also seemed to have forgotten that the land once belonged to others, before it was lost in the very painful chapter of history in the region. Yet the legacy that we see is the family, with a bible, a gun, and a wagon wheel. Paris? Toulouse? Perhaps Lyon? No, not really, but the city that is home to this park was profoundly influenced by its original French-American inhabitants, who named their town after their beloved king, calling it St. Louis. Lafayette Park, also known as Lafayette Square, is the oldest public park in the United States west of the Mississippi River. It was dedicated in 1851, 10 years before the Civil War. It is found on St. Louis’ south central side. It remains a treasure for anyone who appreciates urban design and American architectural history. The former upscale neighborhood surrounding the park has been well-preserved, including the elegant French row houses and mansions. This is where the 1 percent called home in the city’s heyday. I visited in early January and found the public space well maintained and used by dog walkers. If you visit St. Louis, visit this park and spend a few hours wandering the neighborhood.